The Milton Creek Restoration Project worked with nine landowners to enhance approximately 0.9 miles of Milton Creek by managing non-native vegetation and planting with appropriate native vegetation. 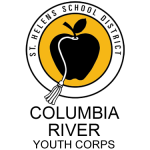 The project included removing reed canary grass and other invasives along the riparian area, and plating nearly 15,000 native trees and shrubs. A seasonal tributary to Milton Creek was also improved by fencing-off and planting 1000 feet of creek to exclude cattle and reduce sedimentation and elevated temperatures in waters that flow directly into Milton Creek. The total acreage enhanced by project activities includes about 11 acres of riparian habitat. After all the plants were installed, seedling protectors were installed along with 60” bamboo stakes to protect the trees from deer and beavers. Plant maintenance and monitoring will continue for several years to assure project success. 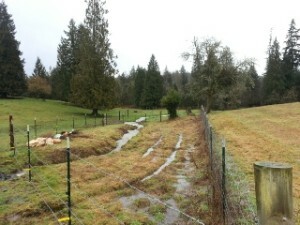 Lower section of seasonal tributary being planted in March 2014 after fencing was installed to exclude cattle from the creek. CRYC (Columbia River Youth Corps.) 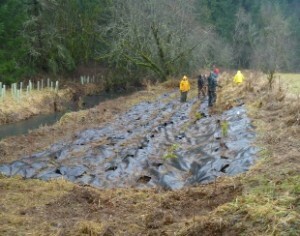 planting and marking plants within the weed barrier being used to suppress reed canarygrass (January 2014). 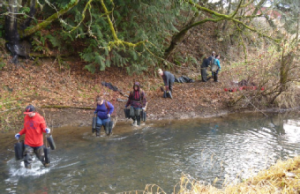 Access to one of the sites was limited but members of the Columbia River Youth Corps worked hard to haul plants into place (January 2014). 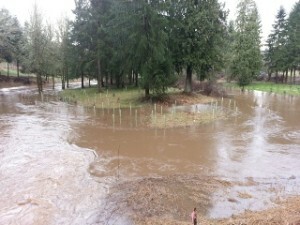 For more information contact the Scappoose Bay Watershed Council at 503-397-7904 or email: info@scappoosebay-wc.org.